Dammit Jim, I'm a doctor not a wizard! Star Trek is a difficult setting to roleplay in. The canon is labyrinthine and confusing, with material drawn from hundreds of episodes, many of which contradict each other. The aesthetics vary widely depending on the time period and the series, making it hard to imagine they exist in the same universe. Powerful technology can easily break your story. Perhaps worse, the Federation is meant to be a utopia. How do you generate compelling conflict in a utopian setting? One of those bright spots I mentioned is the character creation. Instead of simply handing players a bunch of points, the system takes them through each stage of their character’s life, from childhood through Starfleet Academy and into their first assignment. Players decide what kind of life their characters have led and receive points accordingly. If a character grew up on a dangerous colony world, they might get points in Daring. If their parents were diplomats, they might get points in Presence. The list goes on. Character creation is highly structured, which might be frustrating for advanced players, so the system offers an alternative. Instead of going through each step, the players can simply take the equivalent amount of points to be spent at will. While this has the potential to create unbalanced characters, it’s a useful option for players who like extra customization. The only critique I have for the character creation is that there aren’t any well developed options for playing characters of mixed species. All the game offers is a side bar that’s purely cosmetic. Considering how many half-vulcans and half-klingons the Star Trek shows have, this is an annoying absence. Even so, character creation is undoubtedly enjoyable. I made six characters in a row for the review oneshot, and I never got bored. Correction: Originally, this section claimed there were no rules for being raised on alien planet, which is wrong. It also missed the sidebar for mixed species. One of the the major problems with Star Trek as a roleplaying setting is who the PCs should be. The obvious choice is for them to be senior officers, but that has a huge drawback: not every story will feature all the senior officers. This is even more pronounced in stories based on away missions. Even though the TV shows often ignored this problem by sending the entire command staff out in a shuttle, doing that in an RPG will seem absurd. To solve this issue, Star Trek Adventures offers rules for each player to have multiple characters. A player’s primary character is assumed to be a department head or some similar role, but they can also have supporting characters of lower rank. These supporting characters aren’t as capable as the primary, but they can get the job done. 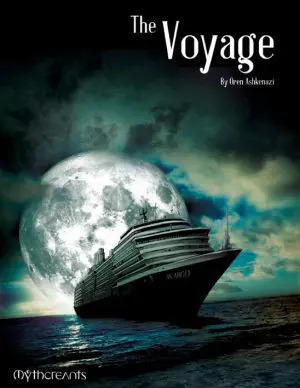 This way, the captain can play their supporting security officer when it’s time for an away mission, or the ship’s counselor can try out an engineer when the story has no call for social skills. This system fits naturally into the secondary cast that most Star Trek shows develop. * Many episodes focus on a guest star who shakes up the status quo, and in most systems, that guest star would have to be an NPC. But in this system, the GM can give the role to one of their players. Supporting characters also allow for important deaths that don’t ruin a player’s experience, because they still have their main character to fall back on. Despite my praise, there are some limits to supporting characters. Used too often, they can leave players disconnected from their main character. To address this, I recommend only using supporting characters in longer campaigns, when there are plenty of sessions for each player to get invested in their primary PC. The other problem with players having more than one character is what to do when those characters need to talk to each other. It’s awkward for the GM to play someone’s character, and even more awkward for a player to talk to themselves. My best advice is make sure there’s an NPC present who can cover for the secondary PC. The primary meta currency in Star Trek Adventures is Momentum. Players earn Momentum by scoring more successes on a roll than they need. All Momentum goes into a communal pot, where it can be spent by any PC. This provides an immediate benefit to rolling higher than necessary, something that a lot of games don’t have. If players roll twice what they needed, they like to get a reward for their efforts, and this game provides them with one. The first problem with this meta currency is that it’s easy to set up a perpetual Momentum machine. By using some common special abilities, players can easily get two points of Momentum from a roll for every one they spend. As you might imagine, this makes it nearly impossible for PCs to fail rolls. The rules also create an incentive for players to find easy rolls they can make to earn Momentum, even if those rolls aren’t necessary. When a character’s focus applies to a roll, their successes count double. That means if they buy an extra die with Momentum and it comes up a success, they get two successes, which likely means they get the momentum back, and even earn a second one. Correction: Players only get two momentum from focuses if their d20 rolls equal to or under the character’s discipline. This makes the Perpetual Momentum Machine less likely, though it still incentivizes players to find easy rolls for generating momentum. To make things weirder, this game features two additional meta currencies. The first is called Threat, and it’s basically Momentum for the GM. Instead of spending Momentum, players can give the GM Threat to get bonus dice. So even if the PCs haven’t built up a large pool of Momentum, they can get as many dice as they like. In theory, the GM can then use Threat to make the villains more dangerous, but this falls a little flat since the GM can already make rolls as difficult as they like. Adding Threat on top of the appropriate difficulty sets up an adversarial relationship that isn’t good for the health of a campaign. But wait, there’s more! The third meta currency is called Determination. It gives a bigger bonus than Momentum, and it’s harder to get. It’s also limited to each character rather than being in a communal pot. While Momentum and Threat are useful for anything, Determination is only spent on actions that line up with a character’s values. This helps differentiate it from the other two meta currencies, but it’s still a little confusing to remember all the different ways players can get bonus dice. It’s also unlikely the PCs will ever need Determination, considering how easy it is to generate Momentum. One thing I can say about Star Trek Adventures is that it has a unique core dice system. When a task is in question, players roll 2d20. Each d20 that comes up equal to or lower than the character’s relevant skill+stat is a success. So if a character has a Command of 3 and a Presence of 10, each die that rolls 13 or less is a success. Different tasks require different numbers of successes, and players can spend Momentum or invoke special abilities to add more d20s. That’s nothing like any other RPG I’ve ever played, and it takes some getting used to. At first, it’s a little annoying to add together skill and stat for every roll, but most players get used to it quickly. However, it’s still weird that without spending Momentum or invoking a special ability, characters can’t ever succeed at a task that requires three or more successes. This is true no matter how good the character is at their chosen task, because they only have 2d20. * Momentum and special abilities are always in ready supply, but it’s not an easy dynamic to learn. Once players learn the dice mechanic’s quirks, it functions adequately but isn’t anything special. The game tries to spice things up by adding a system of environmental traits that influence rolls, but the traits are easily forgotten in the heat of the moment. The book also talks a lot about what to do when a roll is failed, which is good, but doesn’t provide robust rules. The goal seems to be something similar to Mouse Guard, where PCs who fail their rolls can still get what they want but at the cost of suffering a penalty. The problem is that while Mouse Guard’s penalties were baked into the system, Star Trek Adventures’ don’t have much impact. Even though the 2d20 system doesn’t do anything spectacular and has a bit of a learning curve, my group still enjoyed having something else to do with all our d20s. Outside of the D&D family, there aren’t many systems that employ them. A point of Determination may be spent to grant the character a single bonus d20. This bonus d20 diﬀers from most in that it is considered to have already rolled a 1, and thus generates two successes automatically. The normal limit of additional d20s bought for a Task still applies. Instead of just adding two successes, Star Trek Adventures wants you to purchase a phantom d20, then have it roll a 1, thus granting you two successes. The rules are written this way so as not to fall afoul of the system’s maximum dice limit, a limit that isn’t spelled out anywhere and must be pieced together from reading several different sections. It feels like navigating an IRS form. The system also has a serious problem with unnecessary rules. I mentioned before how the GM is expected to assign forgettable environmental traits in every scene, but that’s just the tip of the iceberg. The crowning glory of redundancy is that the system has two sets of rules for tasks that require multiple rolls. The first is called an Extended Task, and the second is called a Challenge. These rules are virtually identical, with only the most minor of differences. When I got to the Challenge chapter on my first read through, I thought I’d skipped back to the Extended Task chapter by mistake. When the rules aren’t repetitive or written like they’re trying to evade a d20 tax, they’re often surrounded by paragraph after paragraph of flavor text. This makes the actual rules hard to find. The most egregious example by far is the chapter on social conflict. Star Trek is all about social conflict, but it quickly becomes apparent that this chapter is a lie. Despite pages upon pages of text, there are almost no rules for social conflicts. Instead, the entire chapter is vague advice on what kinds of social tactics a character might employ. It’s nearly useless, but you have to read several pages to figure that out. This is too bad, because Star Trek could really use a social-conflict system. Rules this badly written are difficult to learn, hard to teach, and even harder to look up. The game can easily grind to a halt because the GM can’t remember a rule, and looking it up is a major chore. Unlike social conflict, Star Trek Adventures has actual rules for physical combat. The good news is they’re mostly free of the overwritten flavor text and repetitive mechanics of other sections. There’s still a few questionable rules, like how you have to spend an action each turn to keep your phaser set to a higher power level, but otherwise the combat is pretty straightforward. The problem is that it’s D&D style stand-and-deliver combat. That is, the combatants line up and take turns attacking each other until one side is out of hitpoints. * Characters in this system may use phasers instead of swords, but the results are the same. The book tries to address this with flavor instead of rules. It has several paragraphs about how important it is for each side to have an objective and why combatants should retreat when injured. But none of that is actually supported in the mechanics. Stand-and-deliver combat is boring. There are few choices to be made and almost no point to creative thinking unless the GM goes the extra mile. This is especially true in a game like Star Trek Adventures. At least in D&D, players can get their fun by building characters from a vast array of options. In this system, character options are limited, so there’s little satisfaction to be had in crafting a combat machine. Combat is also slow. Barring a lucky roll, it usually takes two or three shots to disable an enemy, assuming every shot is a hit. That’s a long time spent away from fun space adventures. I have some sympathy for the designers here, because combat has always been a difficult subject for Star Trek RPGs. Back in the days when Last Unicorn held the license, combat was an inferno of instant death as phasers did enough damage to vaporize a mountain. * But my sympathy has limits. If the designers couldn’t come up with a combat system that works for Trek, they should have forgone it entirely and had the GM resolve fights with a single roll or an Extended Task. As things stand, many character abilities are geared toward combat, and simply skipping over it is difficult. Star Trek has always been about a ship* as well as the living characters, so it’s no surprise this game has ship rules. Sadly, they’re not very good. The system tries to keep things simple by having ships act like large characters, even having their own sheets complete with stats like Engines and skills identical to a PC. This approach has the advantage of saving development time, and Star Trek Adventures isn’t the first system to employ it. The problem with treating the ship as a scaled-up PC is that it blurs the line between them. Except in combat, the rules aren’t clear when a PC should make a roll and when the ship itself should roll. If the PCs are making rolls, then the ship’s abilities aren’t needed. If the ship is making rolls, it takes the focus off the PCs, and a good GM doesn’t ever want the focus taken off the PCs. Most of the time, the ship is little more than a setting for the characters to walk around and have scenes in. It has no mechanical influence on the game. Ship combat is a little better. At least here it’s clear what function the ship provides, and there’s a fun minigame to be had managing how the ship’s power is allotted. The main problem with ship combat is how much reading it requires. PCs have a multitude of options based on their bridge assignments, but few of those options are obvious or intuitive. Unless you have a group where everyone loves to read the rules, expect to spend a long time going through each option, and then going back because you’ve forgotten one. A cheat sheet like those provided by Burning Wheel would be helpful here, but as far as I can tell, Star Trek Adventures doesn’t have one. Even with their flaws, the ship rules in Star Trek Adventures aren’t terrible; they just feel unnecessary. Unless your group is really into space battles, it’s not clear what you’ll do with most of them. Star Trek Adventures eschews traditional stats and skills. You will not find such mundane entries like strength or stealth. 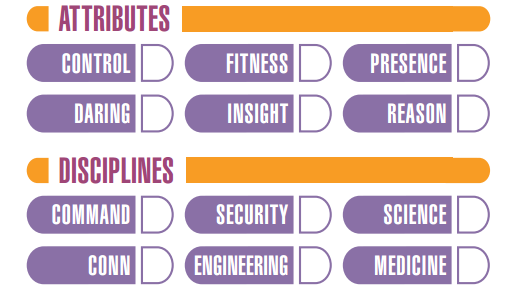 Instead, the designers have created an entirely new set of Attributes* and Disciplines* designed specifically for Star Trek. Behold! You can see a few problems right off the bat. First of all, it’s not clear what some of these even are. What’s Control? And what’s Daring? It turns out Control is basically dexterity, whereas Daring doesn’t have an easy comparison. It’s used whenever a character is acting aggressively or, well, daring. Unintuitive stat names are annoying, but it’s not a huge deal. Worse is that even once you’ve read the rules, it’s often not clear which combination you should use. My first instinct was that melee attacks would use Fitness, and ranged attacks would use Daring. Silly me, melee attacks use Daring, and ranged attacks use Control. At least in those examples the rules actually say what combination of stats and skills to use. Often that’s not the case. What combination should be used when commanding a ship in battle? That sounds like it would be Command, but Security is usually used for combat, and I’m even less sure which Attribute to use. The biggest hole is social skills. I cannot for the life of me figure out what Discipline is best for that. Command works when addressing lower-ranked officers, but what about a superior officer? What about someone outside the command structure entirely, like an alien ambassador? Command feels wrong there, but there’s nothing else that even comes close. This uncertainty about which abilities to use creates two problems. One, it means players don’t know how to build their characters to do what they want to do. A player might build a master martial artist with high Fitness, only to find out that attribute is useless for kung fu. Worse, it gives players an incentive to argue for whichever abilities they’re best at. If a PC has high Command and Presence, they’ll want to use it as often as possible, and the rules don’t provide enough guidance on when to say no. This system does a lot wrong, but more damning is what it leaves out. 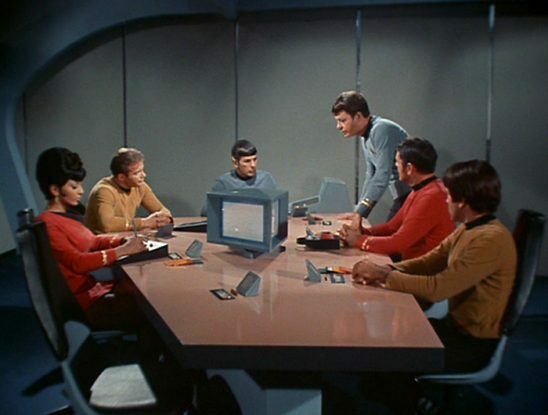 Namely, there’s little in Star Trek Adventures to address problems like abusable technology and the difficulty of creating compelling conflict in a utopian setting. The system makes a few attempts at narrative rules, but they’re completely vestigial. What you’re left with is a run-of-the-mill simulationist system in a setting that it can’t handle. Star Trek Adventures works, but it will require a GM who is both very into Star Trek and ready to wrestle the system into submission. The dense and confusing nature of the rules will make this harder. If you want a Star Trek campaign, the more rewarding path would be to go with a heavily abstracted narrative system like Primetime Adventures or Fate. That way it’ll be easier to gloss over the problems with technology and go straight for your story. Or “get it done” as Captain Jellico would say. Or “do it,” as Janeway was fond of. Deep Space Nine in particular has a very strong secondary cast. Technically, a 1 always counts as two successes, but that’s rare enough to still be a hard limit for practical purposes. Or “stress” as it’s called in this game. 120 cubic meters of rock, to be precise. That’s also true. I didn’t think to mention it because I’m generally okay with games that have a very narrow focus but yeah if you pick this game up wanting to play someone like Quark you’re gonna be in trouble. I have a question for you Mr. Ashkenazi, do you have the same feelings about Fate Core? I don’t think so. I’m not a big fan of Fate, but it’s a very different system with different strengths and weaknesses. I enjoyed reading your article, but there’s several inaccuracies here. Like, all rolls double successes on 1, and Focus only increases that range based on the associated Discipline (basically enhancing “critical threat range” in d20 terms, so the “perpetual momentum machine” is far from a given, even for gullible GMs). Supporting characters are not dedicated to a player – they are a shared resource that can be “activated” on a limited basis per adventure. One of the first rules I read in the book specified a 3-die purchase limit on any task. Ships can provide assistance roles on many types of tasks beyond combat, supporting the Star Trek “ship is a character” mentality. Etc. All of which probably supports your thoughts that the organization of these rules could be better, but playing it once does eliminate most of that. I will say, I agree about the adventure writing advice. Nothing (in any game I’ve seen so far) compares to the amazing advice given GMs in the Decipher ST Narrator’s guide and I still use it. I really want to like this game, and still do at the moment, but I’m one of those dedicated Star Trek fans like you mentioned. Watching YouTube videos on how to play, and searching for opinion pieces like this on the game are probably not good signs of an easily understandable system… and that is what I’m doing. I like the 2d20 method and I like the Lifepath creation system, but I wonder how future supplements will handle Romulan, Klingon, Trader, etc. characters – if we are lucky enough to see them. In my opinion, I would have been fine with Modiphius making two books instead of one, and/or eliminating the flavor text. Good grief. They must have had a page count goal in mind. That stuff, as you say, is EVERYWHERE. They could have quadrupled the number of player character races available if they would have removed a tenth of the exposition- and I’m not kidding. Additionally, additional proofreaders would have helped tremendously. In this age of desktop publishing, these errors are everywhere in media. However, that does not excuse them. The book is rife with misspellings and comma splices. It is also just too wordy. They need a GM QuickStart like they have for PCs (free pdf download). • Increasing the PC’s complication range (downward – 1st point drops the complication range from 20 to 19-20, 2nd 18-20, 3rd 17-20, 4th 16-20. • Creating Complications without PC’s rolling them – 2 points each. • Reinforcements – 1 or 2 points per each. Without this spend, the GM is not supposed to add characters during a scene. • Creating new environmental situations mid-scene. I’ve had 3 sessions where the threat pool went up so fast, and the players luck was so poor, that the end still had a huge pile of threat left (and since it’s supposed to be tokenized, and visible), in the case where they pulled it off left them feeling like I hadn’t been fair; they felt robbed of their success, because it was obvious I was going easy on them. The third, they failed horribly, and it was obvious that I’d gone easy and they still failed. This is from bad rolls right at the star with large pools, followed by relevant complications there from. One of those rolls was 5d20, no successes gained, and 3 20’s showing up – about 1:1108 chance. JT has done that twice in the playtest…. I will say this: The system as adapted does not interfere with a Trek feel… but it won’t create it mechanically, either. • In Fate, when the GM applies the mechanics to your detriment (compels, Invoking your aspects against you) you get paid Fate Points (the metacurrency), and when you invoke yours you pay back the Fate Points. This is a positive reward cycle for accepting the bad juju. • In Cortex Plus (Firefly, Smallville, Leverage, Marvel Heroic Roleplay), the GM has to buy the complications rolled by PCs for them to materialize into traits, and players likewise when the NPC’s roll complications. Again, positive feedback loop for bad stuff happening. • In 2d20, you do not get rewarded for the complications; this encourages those players who are ethically challenged to lie about their rolls. Negative reinforcement loop. Roll Bad early, and it makes things harder. All three are about the same level of complexity, the same level of story-drivenness, and similar levels of indeterminism with gear…. but 2d20 uses metacurrency more often, and for more severe uses, than either Fate or Cortex Plus. One positive change from playtest is that threat range is now worded so it appears to be only for a single action, unless it’s scene framed (and then it applies to the NPCs, too). Stumbled upon this ‘review’ while searching for something else. I think its clear the writer hasn’t actually done any real playtesting of the rules. I’ve been running a group for over a year and they love the game. While its not perfect, over and over what I have heard from my players was ‘it feels like Star Trek’. It’s been a huge success for Modiphius and was a huge draw at GenCon this year one year after release. If you are considering buying and playing this game, please do some other research. I’ve played two long sessions of this game so far and it’s going terribly. The amount of time it takes the GM and the players to find any information about what they want their characters to do is just painful. The Index and Table of Contents are of no help. The rules on social interaction are confusing and not useful. I have even watched many fan created video tutorials on Youtube and read the core rulebook thoroughly. I have felt much more stress than fun while learning this game. It’s a shame, because I am a huge Trek fan. I’m on the same page with you. I’d love to have a Star Trek game that works well but for me this one just isn’t it. I’ve found both Fate and Primetime Adventures work pretty well for Trek though. I’ve been running a game for a while now and to be fair a lot of the faults the reviewer highlights I must agree with him. I’ve taken to only using rules that I like and pretty much doing my own thing with the rest. This game needs a re-write. House ruling for the win! I think you’re right on the money. I don’t mind the “number of successes” bit; I actually think it’s ok. I could care less about Threat and Momentum. Unfortunately, it seems like all of the Species Talents simply modify how Threat and Momentum are used, so that cuts in half the uniqueness of playing a different species, at least mechanically. After 30+ years as a “student” of Star Trek RPGs, I have to say that less rules and mechanics is more… much more. I think you’ll find it’s “fewer rules”. Basically if a thing comes in finite units then it’s “fewer” and “less” if it’s more homogeneous. So, now that you have fewer soldiers; you have less firepower. Now, that you have fewer grains of sand; you have less sand. We have fewer liters of water, so we have less water. Even if things come in different shapes and sizes, it’s the finite identity that causes the word fewer to be used instead of less. So even though rules come in different shapes and sizes, I suspect it’s “fewer rules” not “less rules”. My other common one is:- There’s no K in everything. By default that means there’s no such words as “somethink” nor even “anythink”. Oh and “turret”:- a “turrent” sounds like a cross between something you fight battles with and something you put in a Christmas cake. Rules come in specific packages. Even the introductory rules allude to the rule numbers with rule numbers being retained in the chapter headings. It is never fair to judge a new game system to that of D&D, which is on its 5th full revision. So far I love this system as it supports more of a narrative structure, and less meta gaming, which matches the universe. My players like it thus far, as long as the rolls are about situation you create, I don’t find the Attribute/Discipline system hard to figure out at all. The Attributes are stacked to show the top and bottom are almost opposites, Control/Daring, Fitness/Insight, and Presence/Reason. The book is confusing and lacks brevity, and could benefit from more tables for quick reference. Also, anything that is an open option should have more off the shelf options, like focuses and values. But like i stated, this is a narrative based game system, D&D wins for tactics and meta gaming, but that also requires the GM/DM and players to memorize so many micro rules. Out of curiosity, Zach, what in this review makes you think I’m comparing Star Trek Adventures to D&D? As much as I find the rules are in need of revision the game I am running seems to be going really well using a “Star Trek Lite” version of the rules. The game lends itself very well to narrative gaming and as long as the GM and players are not meta game focused and as a collective want to enjoy the world of Star Trek it makes for a good game. I think you are right, over a period of time and with rule revisions it can only improve and as is a good foundation to work from. Regarding the inability of PCs to succeed on a Difficulty 4+ Task on their own, given how robust the Assist action is (Can the player helping out figure out some way their PC’s abilities can help? Then go ahead and roll a single d20 using that Attribute/Discipline set and add that to the initial player’s roll), I’d say that it’s an intentional attempt to reward focusing on teamwork. Which is pretty thematically appropriate for running a game involving a crew on a Federation starship, actually. 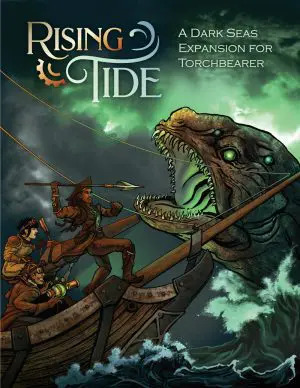 The flexibility of exactly what Attributes go with what Disciplines does require players and GMs to work together on figuring out what needs to be rolled, and that takes the GM getting into a cooperative, “let’s build this story together” mindset, and a fair amount of winging it. I could see a stereotypical “TOMB OF HORRORS IS THE BEST D&D MODULE EVER!” kind of GM having issues. The writing really is extremely hit or miss. The background info is mostly great, the rules are largely okay, some bits spell things out perfectly, and some *really* don’t. There are also more typos than I’ve seen from WotC or FFG games. I do like the fact that the game assumes that all of the PCs are going to be competent at their jobs from the beginning. Also, the GM Screen includes player cheat sheets for basic rules and the stuff various bridge positions can do, which is awesome. Having played and run games in multiple editions of D&D, Warhammer Fantasy Roleplay 3rd Edition, the FFG Warhammer 40k and Star Wars games, and read enough of the rules to be able to play in NWoD and Shadowrun, I could see bits from all of their rules in STA, so it does feel a bit Frankensteined together to me. The last thing I have to say is that one of the supplements allows a truly evil GM to inflict Lwaxana Troi on the players. MUAHAHAHAHAHAHA! I think I agree with you, but was curious as to your reasoning. My reasoning it’s not a good thing is that to get a more readable copy, one must purchase an exclusive book – and many of us already have the retail copy. I’ll admit I’ve been tempted, but I don’t think the black text on white print will help me absorb the game any better. But Oren, you don’t need to write rules for this stuff! Just say it’s important and tell people to roleplay it, letting them handle it however they want. That’s good enough, right? Ugh. I hate the token “Oh, sure, social situations are important. Figure them out yourself.” that so many RPGs include. Can you imagine if someone tried to pull that off for the combat rules? Diplomacy is handled as an Extended Challenge. Resolve (Social Stress): Command + Presence. Damage inflicted is equal to a number of challenge dice equal to 1 + Command. With many of the same features of hand to hand combat – such as Guard easily adjusted to social conflict with no change to difficulty. When trying Deception such outright lying and the like, it is a toss up between a simple roll verse difficulty or just straight up role play. Have at. I personally don’t mind this being set-up the way it was. Just for the record, I don’t super mind a lack of more complex social rules. It’s a little disappointing, but NBD, not every system can have those rules. The issue is that there’s an entire chapter promising me social rules but then there are none to be found. If it just wanted me to handle things the way makes sense to me, a couple paragraphs would have done the trick. As I recall, you don can start out as any rank you like that the group agrees to, you just have the same number of skill points. So one PC is the captain, one is the first officer, etc, but they have the same number of points to buy skills and stats with. From there you gain XP and raise skills like you do in most skill based systems. The difference between a starting character and a character with lots of XP is a lot smaller than it is in D&D. You might get a higher Command skill, but you’ll never become the demigod type character that is a level 20 D&D character. I’m just starting to go through the book for the first time, but I think it’s important to note here that a 20th level D&D character doesn’t look like anything in STA, because the character creation & progression goals are radically different. The idea of STA is for you to portray more or less the bridge crew of a Starfleet vessel (or space station equivalent for you DS9 fans (yes, pre-Defiant) out there) from day one, same as we’re introduced to Kirk, McCoy, Spock, and Chekov on day 1. You do pretty much just choose your rank during character creation and it’s just as easy for someone to start as a captain as an ensign. There are some rules that give you a risk/reward system for choosing a higher or lower rank. Higher rank gives you some benefits for recognition or ‘pulling rank’ in some scenarios, but you’re held to a higher standard than the ensigns of the group. From what I’ve been able to see, the trade-off to starting with the wildly competent characters in STA is that progression is monumentally slow. For the most part, there’s ways to move some points around and ‘retrain’ as you go. For what it’s worth, I don’t see this as a failing of the STA system, it’s just apples/oranges when compared to a level-based progression system like D&D. The system does allow for creating non-starfleet officers – “Below Decks” crewman and such if you want. Just remember, Star Fleet uses a military heirarchy with enlisted and officers. Focus on the enlisted side of things and keep the officers as NPCs. Hell O’Brien worked his way into a primary character and he was just a Chief Petty Officer – yet headed the engineering department of DS9. Hey there! Middle-aged, long-time table-top RPGer – been playing various RPGs since I was 8 years old (1981). In anycase, I’ve been playing STA since the play test. Between the old FASA percentile system, LUG/Decipher, d20 Prime Directive, and STA – for me STA hits all the marks for Star Trek. …the “meta-currency” interferes with the occurrence of players outright failing. Yes, I believe failure/set-backs are integral to an enjoyable game experience. As a player I don’t want to have any kind of agency to put matters such I increase my chance of success beyond that which my character is capable. As a GM, I loathe seeing any kind of agency that usurps the natural flow of the game. Sometimes things just go badly AND that should NOT be decreased, removed, or enhanced in game play. Beyond those two criticisms, I love the flexibility and apparent simplicity of the system. I have yet to have a session in two years of running in my home group and at Save Against Fear in Harrisburg that failed to feel like Trek. To each their own. If you’re looking for a “clearly-defined” system – STA won’t work for you. It focuses on not getting bogged down with minutiae. Except when dealing with Threat and Momentum. Come to thing of it, most of the rules and “exceptions by rule” deals with Threat and Momentum.